But before you apply you must check out the eligibility criteria, important dates, examination pattern for this recruitment. 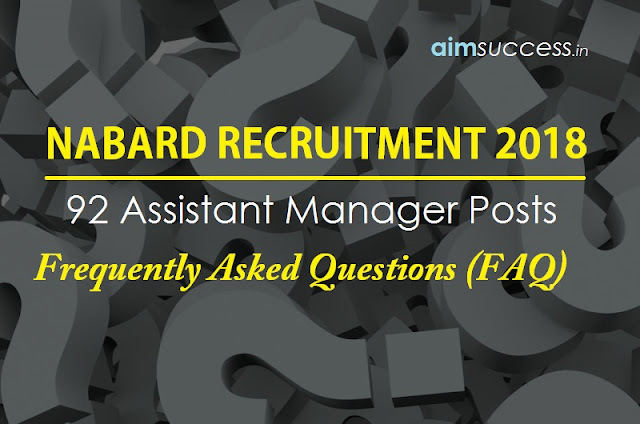 Here are the answers to all Frequently Asked Questions about NABARD Assistant Manager 2018 Recruitment. The Tentative dates for Preliminary Exam is 12th May 2018. The Tentative date for Mains Exam is 6th June 2018. Yes, Applicants qualifying in the Phase-II Examination and securing sufficiently high rank in merit shall be short-listed for interview. Will the exam conducted online or offline (OMR Based)? Common Written Exam for NABARD Assistant Manager will be conducted online (Both Phase-I and Phase-II). The candidate must be between 21 and 30 years of age as on 01.03.2018, i.e., the candidate must have been born not earlier than 02.03.1988 and not later than 01.03.1997). Following is the required educational qualification for specific disciplines. The candidate must possess the required educational qualification as on 01 March 2018. The result of final term /semester/year examination of the required educational qualification must have been declared on or before 01 March 2018. Bachelor’s Degree in Veterinary Sciences/Animal Husbandry with a minimum of 50% marks (SC applicants 45%) in aggregate or Post Graduate degree in Veterinary Sciences / Animal Husbandry with a minimum of 50% marks (SC applicants 45%) in aggregate from any recognized University / Institute. Bachelor’s degree in any discipline from a recognized University/Institution with Membership of Institute of Chartered Accountants of India (ICAI). The Membership of ICAI must have been obtained on or before 01 March 2018. Bachelor’s Degree with Economics/Agriculture Economics with 50% marks (ST applicants -45%) in aggregate or Post Graduate degree in Economics /Agriculture Economics with a minimum of 50% marks (ST applicants-45%) in aggregate from a recognized University/Institution. Candidates with Economics as one of the main subjects at all years/semesters of the course, will only be eligible. Bachelor’s degree in Environmental Science / Environmental Engineering / Climate Change / Climate Change Adaptation with 50% marks in aggregate or Post graduate degree in Environmental Science / Environmental Engineering / Climate Change / Climate Change Adaptation with 50% marks in aggregate, from a recognized University/Institution. Bachelor’s degree in Food Processing /Food Technology with 50% marks (ST applicants 45%) in aggregate or Post Graduate degree in Food Processing /Food Technology with 50% marks (ST applicants 45%) in aggregate from a recognized University/Institution. Bachelor’s degree in Forestry with 50% marks (SC applicants 45%) in aggregate or Post Graduate degree in Forestry with 50% marks (SC applicants 45%) in aggregate from a recognized University/Institution. Bachelor’s Degree in Agriculture / Agriculture (Soil Science/Agronomy) with 50% marks (SC/ST applicants - 45%) in aggregate or Post Graduate degree in Agriculture / Agriculture (Soil Science/Agronomy) with a minimum of 50% marks (SC/ST applicants 45%) in aggregate from a recognised University / Institution. marks (SC/ST applicants 45%) in aggregate or Post Graduate degree in Hydrology/Applied Hydrology or Geology/Applied Geology with Hydrogeology /Irrigation /Water Supply & sanitation as one of the subjects with 50% marks in aggregate (SC/ST applicants 45%) from a recognized University. Some Universities/Institutes do not award Class or percentage of marks and allot Aggregate Grade Points (e.g. CGPA/OGPA/CPI, etc.). In case University/Institute defines criteria for conversion of Aggregate Grade Point into Class and/or percentage of marks, the same will be accepted. Rs. 150/- for SC/ST/PWD candidates. Rs. 800 /- for all others. Till when can I apply for this recruitment process? Registration will start from 13th March 2018 and will end on 02nd April 2018. I am 19 years old. Can I sit for the exam? It will be an Online objective MCQ exam carrying 200 marks for a duration of 120 minutes which is composite time for all the sections in the test. It will contain of two Papers I and II, both will be conducted online. Paper-I will be a Descriptive Writing Test of General English and Paper II will be an online objective MCQ Test. There is no fixed cut-off. After each phase of the examination, the cut off is declared by the organization.